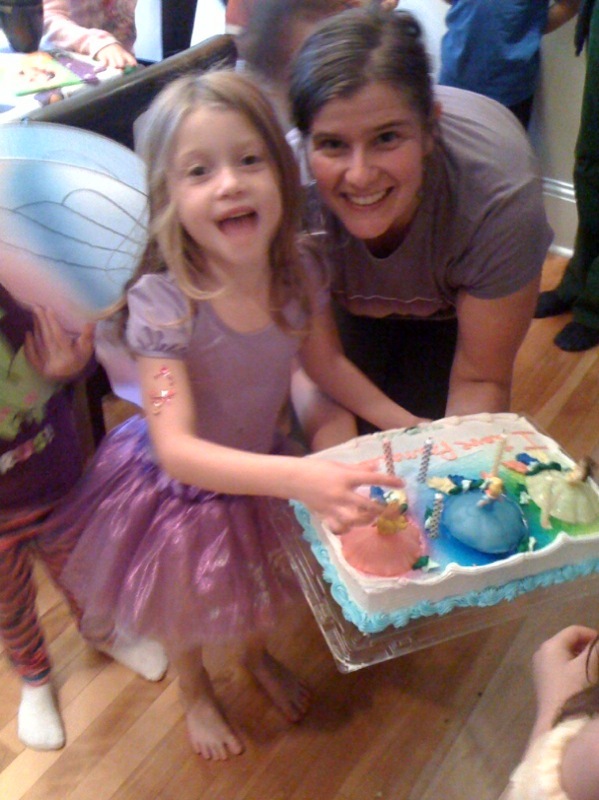 Leila turned 5 on the weekend. She kept asking me when the kids would get here for her Princess and Witch party, because she would still be four until then. “So, now you’re still four?” I asked, the morning of her birthday. Funny, I remembered her being born around 6 a.m. Whoops Mom, going into real time again. “Yes, Mom.” She shook her head. “So when the kids get here, that’s when I’ll turn five.” Determined. Believing. I love that about her. Then she comes out of nowhere. “Mom, will I be created again?” I smile, not sure how to answer. We’ve talked a lot about death in our family. Over the past two years, we have lost her Grampie Garth, her baby sister Tya, her Great Grampie Earl, and most recently, Nannie’s dog, Harpua. We’ve gone through every story in the book, I’m sure. You’ll be light and love in your next life, Leila. You’ll be butterfly wings that fly and shimmers that live close to the moon. You’ll be dirt and grass, and little bird’s songs. You’ll be an old wise ancestor. You’ll be a cloudy day and then a sunny one. You’ll be one of Saturn’s rings and then one of Pluto’s moons. And you won’t mind it. Ah, death. Death is like an old friend at our house. But when Lei asked me if she would be created again, I didn’t know what to answer. I thought about all the beautiful creation myths that we have from all the countries in the world, and how they are encompassing. They are enough. They are simple, and sorted. Filed under “C” for creation. Why is it so complex on the other end? Why can’t we have a new batch, filed under “D” for our final eternal graduation? I don’t like Heaven. I’m thirty years old, and something in me is still fighting against my Roman Catholic upbringing. Why? Why, Mo?! I don’t know why I can’t just give in, and let the gigantic wave of dogma take me out to sea, to the pillars of my Christian upbringing, until I’m floating in the ethereal abyss. Take me, pearly gates! Take me, Philly Cream Cheese Angel! One step down the mental spiral staircase. It’s not heaven that I don’t like, it’s everything that goes along with it. It’s the picture of a white man in sandals that steps on the clouds. It’s that it’s the same for everyone. It’s like one big, shiny box and when you die, you go there. Will this make death intimate? Will this make death personal? I admit, it might be the whole ‘angel’ idea that I dislike. When a baby dies, people don’t know how to react. So they go where they know – to Angels. It’s chartered territory. She’s an angel now, I get it. But something in me reacted negatively about all the angel business – I’m a twenty-first century mom who loves talking about physics and energy, but at Book of Revelations I seem to want to draw the line. Starting with the fact that I’m a hysterical non-believer. I like reincarnation for two reasons. The first is that is suggests that death is transitory – that we are not gone, but changed. Our living beings of light and love are real and are valued. As important as we are in one life, we are in the next (or as unimportant we are in one life we are in the next, but we’ll not get to that today). Number two. Kids seem to easily accept this. Okay, I’m a bird. BAM. Okay, I’m a twelve year old in India. BAM. Okay, I’m a tree. Great. I’ll be beautiful in the fall, sway in the breeze, and people will write poems about. Restful. Peaceful. Not without expectation, but not expecting your life in the sky, either. Yes, Lei, you will be created again. For now, my Angel’s on Earth. love this. and yes. we have similar conversations at our house. i have similar angel issues. maybe we should get Lei & O together. i suspect the two of them could lead a fine discussion on death, reincarnation, what might be out there after you die, and how you won’t mind it that would put most adults to shame. Love. Love. Love. From another hysterical non-believer. PS. I’m so sorry to hear about Pua. Yo Yo Yo, said the little tree to the worker ant… hows life treatin ya? Oh, not too bad, said the worker ant… fairly busy. ….!!! Is there any difference… Creation is creative… but we are all still created. Just like we are all recycled in the large green bin of the universe. Heaven, Big Green Bins, Reincarnation… it’s like arguing which religion is better…??? None, all of them, and the one that especially speaks to you. Why label, and define something undefinable? The one thing for sure that you can believe in, is that there is something to believe in… what exactly that is would be the creative part! Was she created again, sure, because that’s what she believes. I’ve lost count of how many leafs I have turned, but although I am the same, but there is no doubt I have created change. Thanks Mo, awesome story… Philly cream cheese! hahahah! love this post Mo, and the picture of the fairy princess! Mo, so glad you stopped by my blog so I could follow your writing back here. This post was very timely and beautifully written. Just last weekend, our soon-to-be-five year old seemed to truly absorb the idea of death Our beloved pet was put to sleep in early summer, but it was only after seeing an historic house and a recreated child’s room (Mommy, where’s the little girl who lived here?) that I think our daughter finally began to grasp the concept of death as being truly GONE–I was not even remotely prepared for the question of: Will I Die, Mommy? I was a puddle. There’s nothing we wouldn’t do to provide our children with a few more days/years of precious innocence, would we? I love this, Mo – so beautiful. Leila is SO, so fortunate to have such a thoughtful, wonderful mom. If those are the types of answers she gets to her “big” questions, she’s going to be a very grounded, well-rounded girl. This is a beautiful post and my heart breaks reading it. My 4-year-old has become obsessed with the idea of my death ever since my stillbirth in June. She’s bringing it up less these days but we visited my dad’s grave and that really upset her. I think it was her first time thinking about the fact that PARENTS aren’t always here. I don’t know how to calm her fears because it’s true: I will die someday. And I’m not Christian either so I I don’t feel comfortable telling her that we’ll meet again in heaven. I DO tell her over and over and over that a mother loves her children every single day, now, later and even once they’re not alive anymore. Mo! I didn’t know that Harpua died!! Also, great blog. I’ve been wanting to see you guys more lately, and I can’t believe Lei is 5. I feel like summer has just barely ended. I’ll read more soon. give me a call/text when you have some time. Very refreshing, and well suited to the time of year when we see the swing of the cosmic cycle outside our windows. Is it hypocritical to say Amen to something like that? They don’t own the word, do they? Let words and ideas float through the breeze and germinate where they may, is what I say. I certainly enjoy the easterly gusts from Mo’s mind up here in T Bay!